This lovely, simple lemon cheesecake recipe tastes sweet and citrusy. This is a simple recipe to serve after dinner to delight your guests, but it works as a lovely lemony treat for summer teatimes as well. There’s no baking involved either! 2. Pour the condensed milk into a large bowl. Add the cream cheese and lemon zest and whisk together. Mix in the lemon juice and pour into the tin. Chill for 2 hours. 3. To serve, take the cheesecake out of the tin and place onto a plate. Warm the lemon curd with 1tbsp water and then drizzle over the cheesecake, finish lemon zest and raspberries. Why not top your no-bake lemon cheesecake with some raspberries? 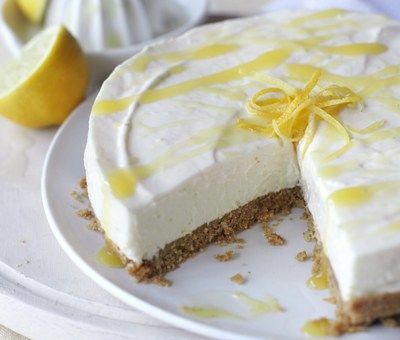 Tried our no-bake lemon cheesecake recipe? Let us know by clicking ‘I made it!’, or give us your tips and tricks on the discussion board. Made this lemon cheesecake loads of times for family gatherings. Always a favourite with everyone asking how it's made. Does sometimes come out a little runny but still tastes amazing! Hello Lauren, we are very happy to hear we have another Carnation Cheesecake fan! I love this cheesecake, just wondering if it would work well with Limes instead of lemon? Hello Lisa, the acidity of the lemons reacting with the Carnation Condensed Milk is what 'magically' sets this dessert. Why not try substituting 1 lemon for 2 limes and add lime zest through the mix to give this cheesecake a zesty zing. Mine worked perfectly. Shame you can't upload your own pictures so others can see how they come out. But I was very happy!! Hello Alex, we have an active Facebook page which is perfect for sharing. Search for 'Carnation UK' on Facebook and share away! Made as instructions say, I even left it in the fridge for 5 hours instead of 2 and it was just a sloppy mess once I took it out its tin, nice flavour and the base was yummy, but I won't be trying this recipe again. Hi Rebecca, sorry to hear your cheesecake is misbehaving...our cheesecakes are a softer set using citrus juices to thicken our condensed milk and this means we can avoid using gelatine. Best to use large lemons and to give it the full 2 hours or longer if you can. Followed all the steps to the letter thickened beautifully, but be aware this does not set like a cheesecake more like a soft mousse. If you need a firmer set the addition of a lemon jelly dissolved with a tablespoon of water works wonders. Very tasty. MG I made this for a family occasion for the first time - it was superb and set well. Only change to the recipe was to use 4 Medium sized lemons - quite tangy but lovely! Hi Edith the magic of this cheesecake is the way the lemon and condensed milk thicken but if you want a firmer set then powdered or sheet gelatine will both work well. This cheesecake is amazing! I don't eat cheesecakes usually but I love this one and so easy to make too. Can I use Carnation Light condensed milk instead? Hi Angie, Carnation Light Condensed Milk is a good substitute in almost all of our recipes. It works beautifully in the particular cheesecake. Hi Jackie, glad to hear you are enjoying the Carnation recipes. This recipe can be prepared up to 3 days before serving but it doesn't freeze well. The best is to leave it in the fridge before serving. Made it today and it was gorgeous. Love the light And creamy texture. I got this recipe last night and I had never made it before! I tried to make and it all went fine, until I put it in the fridge to set! I left it 3 hours and it still hadn't set! I left over night (12 hours) and it still isn't set! I am really disappointed! I made this cheesecake with 6tbsp of lemon juice as I had no fresh lemons and it turned out delicious. Will definitely be making it again. I made this after having done two of the different Banoffee recipes on this site. I have never really cooked or made desserts in my life and did them all at Christmas. Everyone agreed they were delicious and I'm now branded the king of desserts! Just about to make another one for some friends we're seeing later. Thanks! Hi can I use double cream instead of soft cheese? Hi Alison, as this is a cheesecake it really needs the soft cheese for flavour and texture. Why not try our lemons creams or lemon tart if you are looking for a dessert without cheese. Made this recipe yesterday and it was very easy to follow and the best cheesecake I've tasted. Turned out perfectly. Hi Joleen, sorry to hear your cheesecake is misbehaving...our cheesecakes are a softer set using citrus juices to thicken our condensed milk and this means we can avoid using gelatine. Fresh lemon juice has better results than bottled. Best to use large lemons and to give it the full 2 hours or longer if you can. In your no bake lemon cheese cake, is it absolutely necessary to have fresh lemon juice (I only have access to bottle lemon Juice)? Hi Zoe, it’s the acidity of the lemons that sets this delicious, zingy cheesecake. The bottled lemon juice will not have the same result so we'd always recommend fresh zesty lemons. I made this and it was fab, I made my own lemon cheese to go on the top, the family said it was the best one I've ever made! Hi Lyndsay, the family are always the best judges! Glad you won them over! Hi Carol, if you'd like to use orange for flavouring we would recommend adding the zest of 1 orange. You will still need the acidity of the lemons to set the cheesecake but the orange zest will make more citrusy as opposed to lemony. Enjoy! I have just made this tasted divine... served with homemade lemoncurd...yum. Cant fault recipe. So easy and very yummy. Texture quite light, more of a mousse texture. Made it yesterday for the first time for supper party. Guests asked for seconds. i made the lemon cheese cake today,it was a disaster...could it be because i used carnation LIGHT condensed milk. Hi Christine, oh dear... No the light should work fine. Did you use fresh lemons? Made this for friends who are all great home cooks!!! Loved it. They all wanted the recipe!! I made this Cheesecake for one of my food technology classes and when my teacher tasted it she said it would have been an A* for a GCSE. Wow Aimee, well done you! We think you deserve a A* too! I made this lemon cheesecake for a dinner party and everyone loved it. Didn't heat up lemon curd, instead I spread a thin layer over the whole cheesecake. Will definitely be making again, easy, quick and delicious. P.S. set fantastically. Hi Paula, so glad you liked it! You could also try a lime version and top it with tropical fruits such as lychee, mango, pineapple, kiwi and passion fruit if you like?! Hi Karen! Just goes to show homemade can be easy if you know how! Hi Jude, sorry to hear your cheesecake is misbehaving...our cheesecakes are a softer set using citrus juices to thicken our condensed milk and this means we can avoid using gelatine. Best to use large lemons and to give it the full 2 hours or longer if you can. Hi Lore, we wouldn't suggest using an electric whisk - it should be fine so not sure why it did not set - glad you made delicious use of it anyway! Hi just made the lemon cheesecake. Replaced 100gs digestives with 100gs ginger snaps. Added 1/2 lime to lemons. Also put some lemon curd in the creamcheese and condensed milk mix. Then decorated with strawberries. My 6 year old wanted a cheesecake for a birthday cake. It came out yummy. My family like this so much I have to make one every week!! This is superb. I made the lemon cheesecake today despite being slightly dubious (re: last comment on setting) but it turned out PERFECT! I used 3 lemons for juice and zest and chocolate digestives for the base. Beautiful, and soo easy. My lemon cheesecake would not set- followed recipe to the letter. Disappointing. Hi Maria, sorry to hear your cheesecake is misbehaving...our cheesecakes are a softer set using citrus juices to thicken our condensed milk and this means we can avoid using gelatine. Best to use large lemons and to give it the full 2 hours or longer if you can. I made this cheesecake at home and was complimented that it was one of the best cheesecakes my family had tasted! Have made this a couple of times again and definitely plan to make it again!! Fab recipe!! Would love to make a coffee cheesecake using this recipe but not 100% sure how to set it!! Hi Jorden, wow sounds like a great success! We would suggest you turn the Baked Toffee Cheesecake into a coffee cheesecake as its essential to use lemons to set the one you've tried. For this recipe you will need to mix about 4-6tsp Nescafe coffee granules into 2tbsp boiling water until dissolved then add this to the creamy mixture. Taste it first so you can check the strength! You can still swirl in the caramel if you like or leave it plain - up to you! Thanks Helen, yes please do tell! We are big fans too! This is really delicious and so easy to make. I added the juice and zest of an extra lemon as we prefer it a little less sweet. There is loads of it so need quite a deep tin. Topped it with clementine slices - yum! Hi Katharine, lovely idea - that sounds deelish! No-Bake Lemon Cheesecake Recipe is rated 4.6 out of 5 by 25. Rated 5 out of 5 by GRivers90 from Amazing!! This cheesecake was super easy to make a delicious!! I used more biscuits as it would have been a very thin base. Was still thin with 200g. Would use more next time. I also added 100g of white chocolate melted and cooled and a spoonful of lemon curd to the mix. Was so yummy! Set perfectly. Rated 5 out of 5 by Maidie from Wonderful cheesecake all the family love it. Wonderful recipe always a treat for family . Always a special treat at birthdays etc. Rated 4 out of 5 by PaulB from Lovely So easy. But what happened to the first lot of zest? Should that go into the filling? It mentions more zest to decorate so I am assuming it should go in the filling. Rated 5 out of 5 by Debby696 from No bake lemon cheesecake Perfect pudding to impress! So so easy and quick to make too. I admit I use the zest of 2 lemons but the juice of 4 as I prefer a really tangy taste. I also use ginger biscuits to get that perfect lemon and ginger combination. Yum! Rated 4 out of 5 by John from sale from bsck to the 70's 56 year old male......i was reminiscing with my mum about a cheesecake we used to make in the mid 70's... Put the ingredients in Google and lo and behold this popped up.... Identical apart from gingernut base in those days... Still going strong after 40 years!